Native to outback regions of central Australia, cockatiels are one of the most popular pet birds in the world. The sociable and generally gentle cockatiel has become a treasured pet that will do well in most households. Cockatiels are one of those species of birds that falls into that gap between small birds and medium parrots. They are larger than Parakeets, but quite a bit smaller than Amazons & African Grey Timnehs. They are known for having calm and affectionate personalities which is one of the reasons they are popular pets. In fact, their personality is so submissive that they can be bullied by other birds even small birds like parakeets (budgies). If you plan to house them with others, watch them careful to ensure they are not maltreated. They enjoy time with their owners. Spending time on your shoulder, head scratching, conversations are always welcome. Not known for their vocal abilities, Cockatiels do whistle. Especially the male. If affection is the personality you prefer, consider a female. Probably the most important thing to consider when selecting a bird cage for a Cockatiel is the interior space. Most experts recommend getting as large a bird cage as you can afford, but it is also very important to consider the bar spacing. 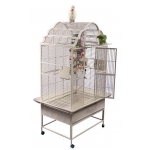 As a guideline, shop for a bird cage that is a minimum of 20 inches wide, 20 inches deep, and 24 inches height. Virtually any medium sized stand-up cage will work well for cockatiels. As you shop larger cages, also watch the bar spacing. Ideally, your Cockatiel cage should have a bar spacing of 1/2" or 5/8", and as wide as ¾ of an inch. 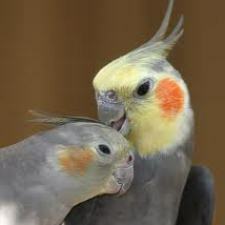 Cockatiels are very susceptible to strong smells such as insecticides, smoke and air fresheners. Their respiratory system is so efficient some of these can kill a cockatiel. For example the coating on Teflon pans, if they are heated to too high a temperature, can give off a poisonous gas that can kill a cockatiel. Because of this, keep the cage completely away from such odors. They also do not like drafts so keeping them away from windows and doors is important. At night cockatiels like to have their cage covered to stop drafts. - Cockatiels fall inbetween a small and medium parrot, bar spacing between 1/2" to 5/8" is best. Be sure it does not exceed 3/4"